McALLEN — As the Trump administration continues to dig in its heels over the separation of immigrant children from their parents, interfaith leaders here will hold a vigil and prayer walk Wednesday night in support of reunification and keeping families together. 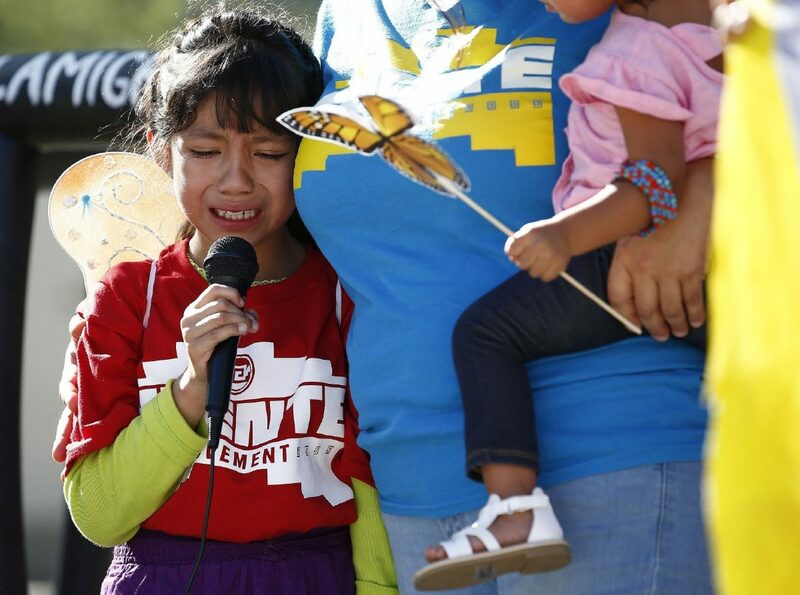 The event, organized by Catholic charities of the Rio Grande Valley, will begin at 7:30 p.m. at Archer Park in McAllen with a vigil and prayers from faith leaders in the name of the children being separated from their parents. The vigil and walk will end at the federal courthouse a few blocks away. The event comes as pressure continues to mount for those in the Trump administration, which has continued to defend its practice of separating children from parents as a deterrent to illegal crossings into the country. The administration went on the defensive Monday, a day after members of the media toured the McAllen processing center at the epicenter of the separation of children from parents. Homeland Security Secretary Kirstjen Nielsen spoke at a news conference Monday evening, moments after an audio recording from inside an immigration facility was made public that purported to be audio of crying immigrant children within the facility. As members of Congress continue to descend on the Rio Grande Valley — with tours at the immigration processing center, the detention facilities where the children are being housed, and the various ports of entry — they remain steadfast in their message that Trump can immediately end family separations at the border with the stroke of a pen. U.S. Rep. Filemon Vela, D-Brownsville, who hosted members of Congress and local advocacy groups at a immigration roundtable Monday in Brownsville, said the rescission of U.S. Attorney General Jeff Sessions April 6 zero tolerance memo would stop this policy of separating children from parents. Since that memo was released, U.S. Border Patrol officials have worked to send every person who crosses into the country illegally for criminal prosecution, leading to an increase in the separation of children from their parents. Border Patrol Rio Grande Valley Sector Chief Manuel Padilla Jr., who met with members of the media Sunday, said there was no policy of separating families, instead stressing that if there are no consequences for those who enter the country illegally, the result could potentially be a larger number of immigrants coming into the country. Padilla, echoing Sessions, said the implementation of the policy is designed to deter future illegal crossers. President Trump on Monday took to social media to blame Democrats for not doing enough to protect the country’s borders. Critics, however, view the current administration’s policy as a ploy to negotiate funding of a border wall along the U.S.-Mexico border. In a prepared statement, officials with the Mexican American Legal Defense and Educational Fund called for Sessions’ resignation. “ Our nation’s soul is at stake,” the release stated. It was reported Tuesday that governors from Maryland, Massachusetts, New York, Rhode Island Connecticut, and Virginia declared that their troops would not help to secure the U.S.-Mexico border in response to the administration’s defense of the policy. The first troops made their way from Austin to the Valley the same day Sessions announced his zero tolerance memo, since then more than 1,000 guardsmen have helped Border Patrol maintain surveillance along the border. Possibly also feeling the pressure from constituents, a handful of Republicans are now advocating for legislation that would end the current policy. What: An interfaith prayer walk for immigrant families and children who have been separated.